Maybe it’s time for your teenage son or daughter’s bedroom to get that makeover and bedding is a great place to start when planning a bedroom redesign. As we all know, teens love their beds and designs in teen bedding have come a long, long way in the past few years. There are some fabulous styles available that will suit both your tastes. The best news is that both you and your teenager will love them – now that’s some achievement! 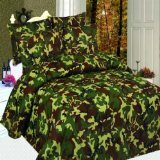 And once you have found a bedding set that you both agree on, the room décor will naturally follow. Pimp Yo’ Teen’s Crib – or How to Choose Teen Bedding! If you hardly ever see your child – and when you do, they’re speaking in an alien language, they’re probably ready to upgrade to a teenage room. You may have been putting this off for many reasons. I’m guessing you’re concerned they’re going to want to paint the walls black or purple. And, you are thinking they will probably cover up any wall space with posters – so what’s the point of decorating anyway? Your teen may be at that stage where a simple enquiry as to how their day went meets with a Neanderthal grunt or rolling eyes. 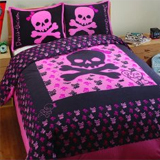 Getting together to redesign a bedroom and choosing appropriate teen bedding probably seems like an impossible and potentially painful process, best avoided! Nowadays, many teenagers don’t just sleep in their bedrooms. They have a TV (with DVD player), a music system and often a computer. So they probably choose to spend most of their time there. Being sent to their room is not a punishment any more! Teens have very definite ideas about what they like – and are even more definite about what they don’t like. For that reason, it’s not a great idea to buy bedding without their input or approval. It’s highly likely that they won’t like it – and even if they do, they’ll say they won’t! Gotta love those teens! TV shows like MTV Cribs have shown teens how their favorite celebrities live. They get to see inside their bedrooms and find out just how they dress their beds. Your teen will probably appreciate that you haven’t got as much cash to spend as Mariah Carey – but it’s amazing what can be created with minimal money and maximum imagination. Teen Movies are big now and they often show bedrooms. A particular favorite is Regina’s room in the movie ‘Mean Girls’. Or how about Summer’s bedroom in TV’s The O.C.? 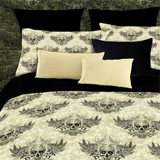 Here’s a quick run-down of the sort of bedding that both you and your teen may agree on. Some of them may sound garish – but they’re all beautiful…trust me! Most bedding has additional extras available, such as matching bed skirts, matching pillows, photo frames, lights…the list goes on. It’s a good idea to get as many of the matching items as you can and to transform your teen’s room.